The best buildings start with an idea, no matter how outrageous it may seem. Together with our clients we build on an idea to turn it into an interesting, useful space. We love our planet so are determined where possible to include products which have already been used. These could include furniture and products which can fit-out and finish the building. We love to give a new life to shipping containers, up-cycling and enhancing the humble box which may have travelled many thousands of miles. To help you with your project we have photos and sketches below which give you some idea of just what can be achieved. 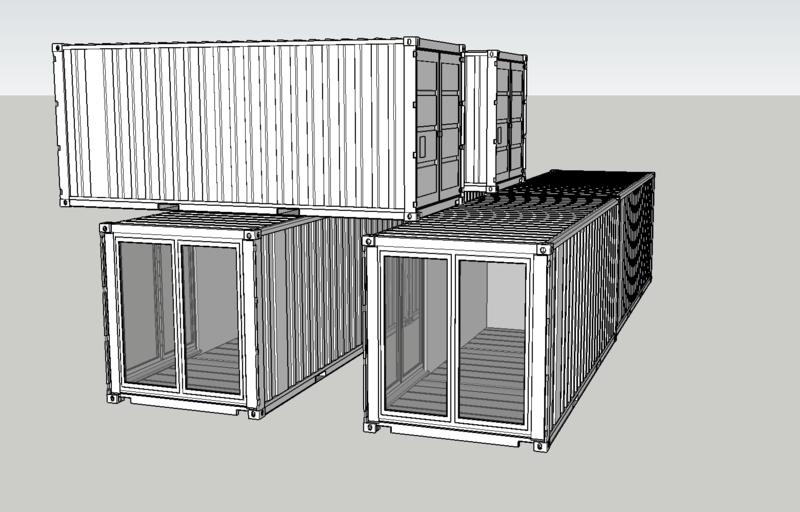 Basic sketch above is based on recycled 20ft containers to provide small business spaces. The units need plenty of light and the total footprint of the area is quite small. Double story units which are cantilevered to provide a more interesting structure. Interest has been shown in this idea for small business start-ups and also by art galleries as the units provide secure, white wall space together with lots of natural light. Note the glazed panels and entry doors. 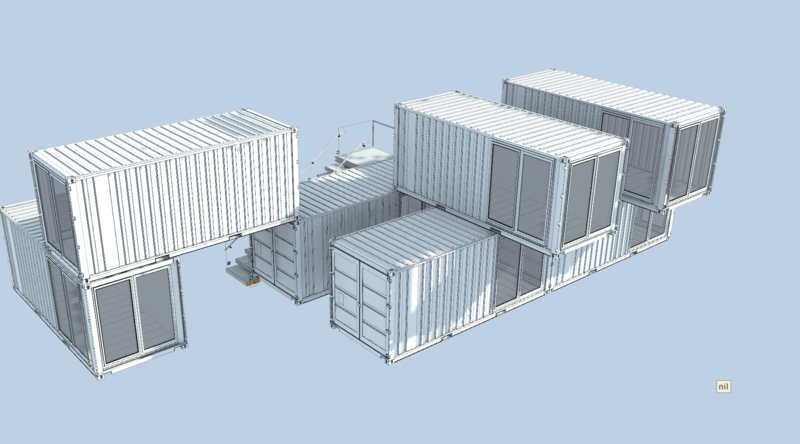 Rendered sketch of a complete scheme for small business units which can be transported from site to site. The units are very similar to the sketch above but incorporate CAT3 lighting and data cabling. As the units are constructed off site, less time is required to build the scheme.Each building connects together easily on site, ready to use. The client chose the finished colour for each unit and the internal finishes. The sketch shows a prefabricated unit 26ft by 10ft incorporating a shower room, kitchen, main bedroom and lounge area. Patio doors are fitted to one gable end. This is a great alternative to conventional build when an extra room is needed for guests, as a 'glamping' cabin or for a need which has been highlighted more recently as affordable emergency housing. We offer a range of sizes and configurations to house single occupancy to large families. Ask about our housing units. Local gyms or even your own personal gym can become a reality with a container conversion. 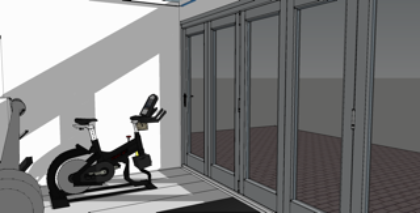 a gym suitable for your garden or as an addition to your business. Glazed doors including bifold are available. Fully fitted with electrics and hard wearing floor finishes. Units can also be used as nursery or playgroup space. Event space comes in many forms including tent or as shown utilising converted shipping containers. This sketch idea shows two connected units to form an open plan bar or retail unit. Converted and fitted out at our factory facility, the unit is delivered and connected together quickly on site, ready to use. Note the lift up canopies. We offer a wide range of solutions including doorways, canopies, roof decks and balustrades. Ask about our design service.